Your Event! Get the party started! If you want to celebrate your wedding in style then you can’t beat having a live wedding band at your reception. It says to your guests that something special is taking place! We are an all-live, 10-piece soul and wedding band, and our passion and enthusiasm for the music we play comes over in our performances all around the Hampshire and Reading area. We aim to have your guests up on the dance floor from the start, joining in your special celebration and making your Wedding reception an evening to remember for you and your guests. We are more than happy for you to come and see us at a public gig, where possible and also discuss your preferred songs from our extensive gig list. It is important to us that we help to make your wedding reception as special as we can. Madison Heights pride themselves on being the most energetic wedding band in Hampshire and Portsmouth. With up to 10 of us on stage at any one time you can feel the energy explode from us and transfer into your guests. There is no better sight than seeing a dancefloor full of people and as a wedding band it’s what we strive for and always succeed in when gigging in Hampshire, Southampton and other areas. We perform Soul, Rhythm & Blues and Motown classics from artists such as Stevie Wonder, Aretha Franklin, Tina Turner and the Blues Brothers mixed in with the funk of James Brown and the great performers from the Stax label such as Wilson Pickett, Sam & Dave and Otis Redding. 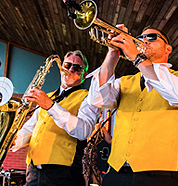 Music that’s guaranteed to make your event an all-out success with your guests! A live band will add a focus and excitement to your function or party in a way that recorded music can’t. And with Madison Heights you will enjoy an entertaining, exciting and professional performance that will ensure your function, ball, birthday/anniversary party is a raging success. Don’t leave your wedding entertainment to chance! Book a band that comprises a team of highly experienced musicians, who thoroughly enjoy what they do, as well as being reliable and friendly.